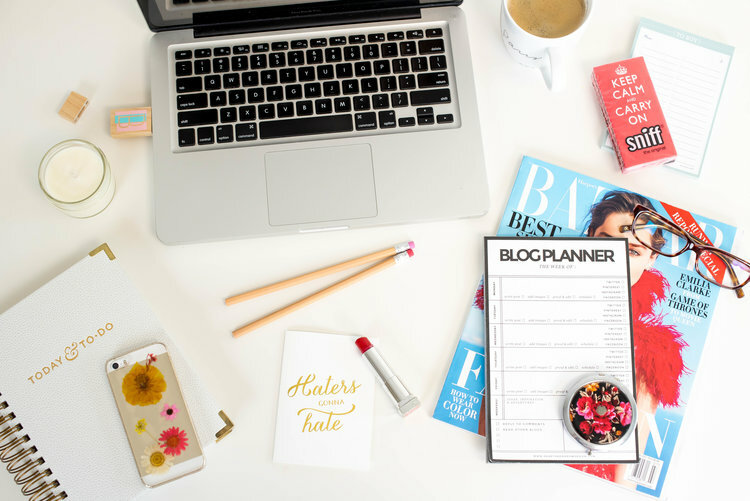 When you’re running a business and you have so many moving pieces, scheduling your posts seems like the last thing on your priority list, #AmIRight? But with social media being increasingly important for promoting your business, driving traffic to your website or blog, and creating loyalty and connection with your followers, it can make your life easier if you have a plan! Any good plan starts with goals, and so we apply that to social as well. We start with S.M.A.R.T goals (Specific, Measurable, Attainable, Relevant, Timely) and ask myself, what am I looking to accomplish with my social media efforts? A SMART goal is defined as one that is specific, measurable, achievable, results-focused, and time-bound. For example a SMART social media goal might look like: Increase engagement on Instagram from 3% to 5% by March 2018. If you’re planning quarter by quarter, aim to have 3 social media smart goals. They can be 3 that are focused on one channel or one goal for each channel. We like using SMART goals, because they are already binding you to think about analytics and measuring the results of your plan. They also force you to look at your baseline, and audit where you are currently in order to create a measurable goal. For busy entrepreneurs we recommend planning out your social content one month at a time if you can. I like to follow the 5:3:2 rule when it comes to content. What that means is that for every 10 posts, 5 should be curated content from other sources that are relevant to your audience, 3 should be content you’ve created that’s relevant to your audience, and 2 should be personal, fun content that humanizes your brand to your audience. Some examples of topics that can help you decide what to post are: Events you are attending or speaking at, seasonal posts ( PSL anyone? ), articles you’ve read or written, fellow entrepreneurs or businesses you want to show support to, posts that drive to your blog or website (think infographics and images that provide value), tips and advice you have, and even posts about your food (who doesn’t love a good foodie post?). We do recommend scheduling out as much content as you can. That way, even if you’re having a busy day and forget to share your latest blog article, you can rest assured that it will get posted. For channels like Instagram, where you do have to post it live, an app like Planoly can keep you updated on what needs to go out and when. Otherwise tools like Sprout Social, Hootsuite and Tailwind, allow you to schedule out your posts and monitor the activity and metrics associated with them. Sign up with your email address to receive news, updates, girl boss interviews, freebies, tidbits, and a weekly dose of email SUNSHINE!